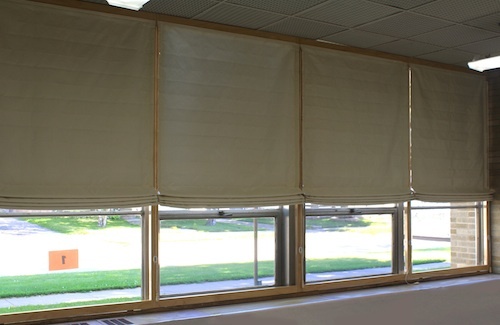 Examples of Customizing the Fit & Finish of HeatSaver® Thermal Shades. Your situation may require going beyond simply choosing fabric and deciding on which side the cords should pull. Below are a few examples of how we have taken extra steps when assessing and taking care of the needs of our clients. For many, having their shades clear the opening they’re intended for is a top priority. 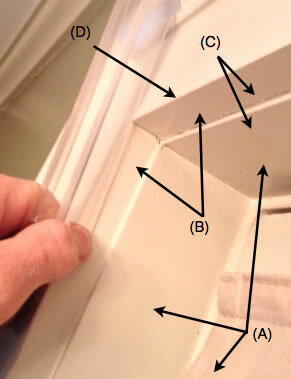 Most often this is for sliding glass doors but can be true for windows as well. 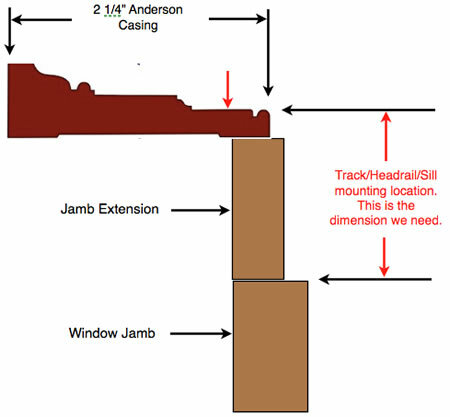 What’s necessary is to provide a consistent surface for the headrail and track. 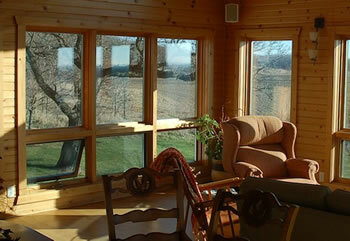 For this client maintaining the views to the fields beyond was a primary goal. The answer here, as in most cases, was straightforward. 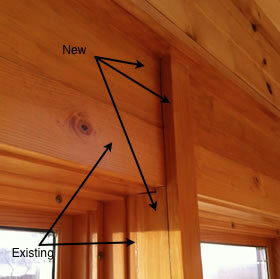 We simply mirrored the existing trim design, brought it in 3/4” and raised it 8 inches. As you can see it all worked out quite well. 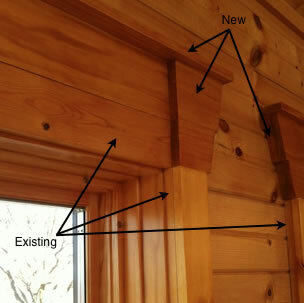 The added trim appeared neither heavy nor intrusive and the additional 8” in height was the exact distance required. 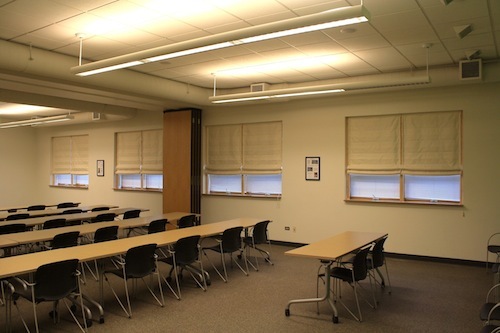 Installing HeatSaver® in the Chicago Center for Green Technology offered opportunities and challenges. It quickly became apparent that the existing openings would not work without some help. They were all out of square, in some cases by as much as 1/4”. So we installed blocking on either side, scribed into place to provide the necessary parallel surfaces. This also allowed for matching blocking in the center, which enabled eight shades to be installed rather than four. The window wells were deep enough to keep the existing venetian blinds. Here the install is about 90% complete with the blocking fixed, the track installed and the shades ready to be raised into place. The installation went very well! Similar to The Center for Green Technology, we designed a frame that mirrored the window frames but stood independent of them. Thus the frames did not detract visually from the windows or obstruct the view. Nor did they attach to the windows themselves. Here the installation is about 80% complete. 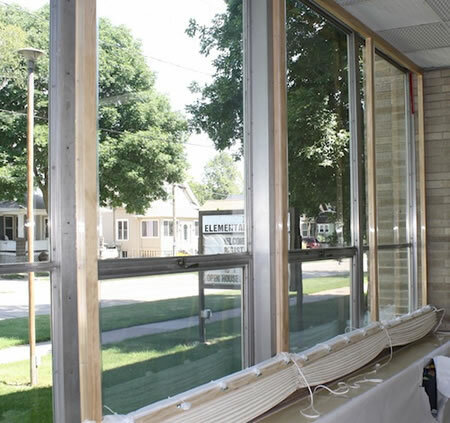 The shades now create a “curtain wall” completely insulating the glass and providing comfort from the chill that used to come off these windows. This is now the most highly insulated part of the building’s entire exterior. Thanks to one concerned Mom and her vision and determination! Thanks also to Lowe’s Toolbox for Education Grants which made the project possible. A high percentage of our sales are conducted solely through emails. Thus we work a lot from photos and PDF’s, continually asking questions and refining details until we know with certainty that all pertinent information has been conveyed and understood. We firmly believe that the mischief contained in Murphy’s Law should be uncovered first thing in the morning, thus helping the rest of the day to go much better! So far we’ve been proven correct in this. 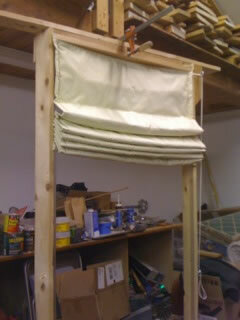 This is fairly common (reference the story at the top) when needing to raise the top of the shades to clear the opening. 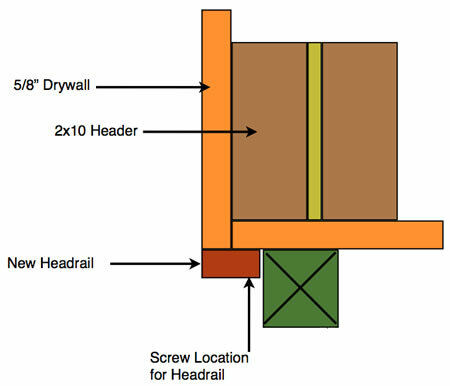 What’s shown above is the surface required for both the headrail and the track. Once that’s defined everything else usually falls into place. This is from a client in Texas. 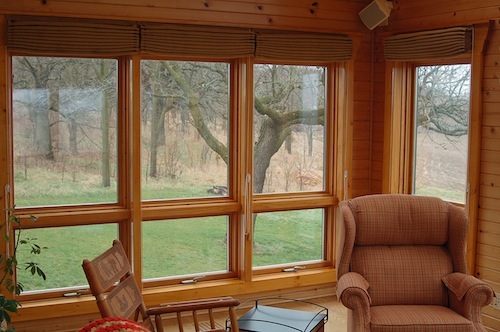 She was able to keep most of her existing window treatments and was thrilled with the results of installing HeatSaver® in her home, saving on both air conditioning and heating costs. Yes, this looks confusing, but with the accompanying notes and ongoing conversation it made complete sense. 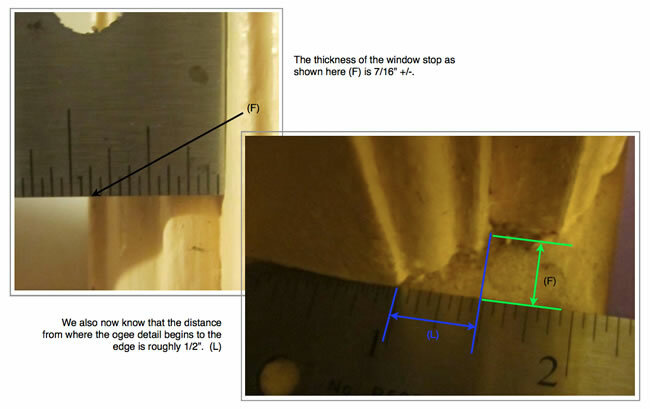 Note that the 1/16” to 1/8” reveal as highlighted at (C) was discussed and taken into account. The result was a truly custom installation for a client in New England. While this may seem straightforward for those who know building construction standards it often helps to be very specific about these various details. Investigating options in a very old home in Massachusetts. 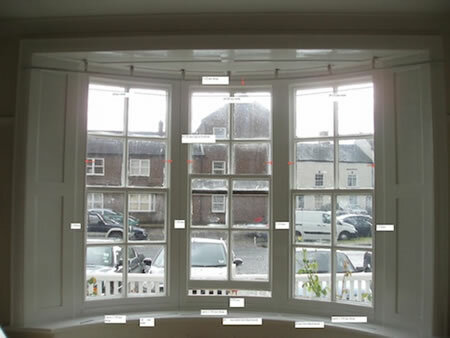 A client who contacted us from Britain in 2011 had eight windows he needed blinds for, six of which were true radius bay windows, meaning the window frames themselves were curved. We traded many emails and photos including very specific dimensions and translated those into templates. The templates were then mailed to the client for verification. Once confirmed the templates were converted into a full sized mockup, closely replicating the size of his finished blinds. Thus installation, operation and final appearance were covered. "Peter, I am very pleased with the blinds. They look and operate well and the rooms I have installed them in do warm up quicker." "Overall I have been very impressed by the service I received from you and your company. 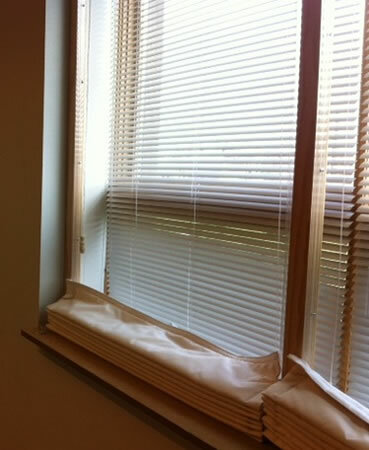 You went to a great deal of effort to come up with a solution for my windows and I appreciate it." While working with a client in Colorado in 2010 it became clear that sill extensions and a larger headrail would assist with operation and help make the final installation more attractive. Both were created with details to match and blend in with the existing trim and stained to the same color. This is a sample of some of the graphics we used while translating the details into final dimensions before manufacturing his shades and making up the trim. operation could be achieved and exposed pull cords would not be an issue. The size and structure of the assemblies was such that we felt it necessary for the shades to be installed and operate completely independent of the window frames themselves. 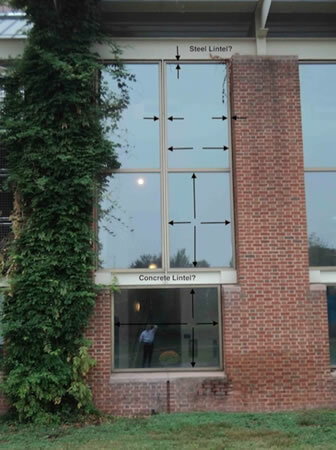 The concrete and steel lintels also would have left voids above and below the windows which needed to be addressed. 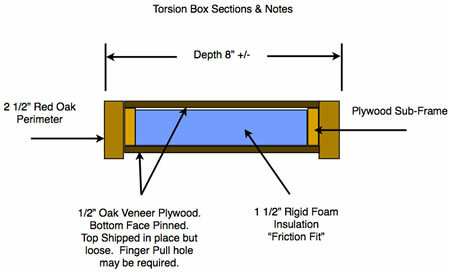 The final proposal included red oak frames to match the size and configuration of the windows with insulated torsion boxes for sealing the voids created by the lintels. The windows themselves would not be touched, yet sealed. The frames would provide a stable, long lasting surface for both the shades and the requested automation hardware.